‘Long time, no blog!’ I feel like I type that every time I actually sit down to write, which you may have noticed is a rarity this weather. I attempted to write this three months ago as I thought that some of you, who liked reading my once regular posts, would be interested to hear my thoughts and how we got on on the day and see what look I chose in the end. 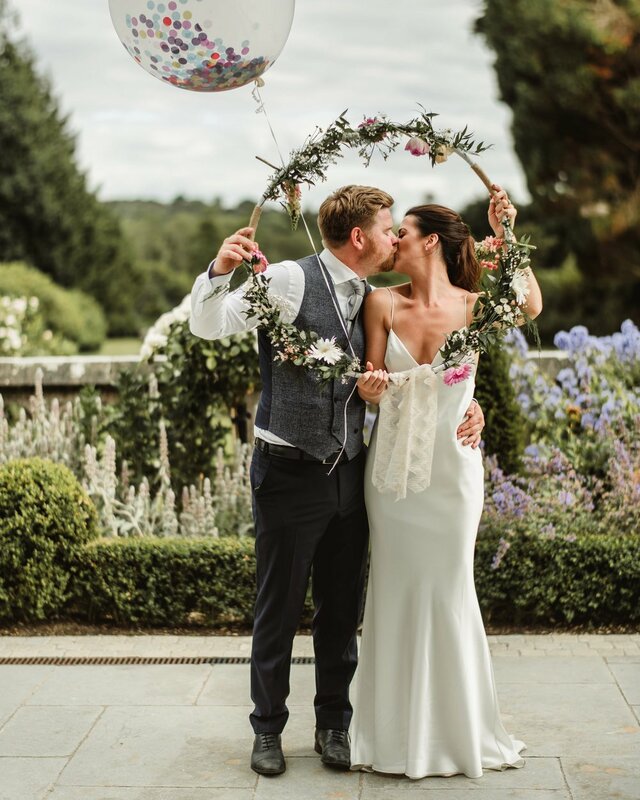 I know that I personally am always curious to see what a bride goes for - I mean, it could be absolutely anything; there is just so much choice and what makes it all so exciting is the fact that every bride’s style and taste is so individual. I saw some beautiful winter brides over the past couple of months - they absolutely stunned, and I’m really excited to catch a glimpse of some seriously style-savvy señoritas over the coming weeks - can’t wait to see the gúnas. I would like to write another couple of blogs so I can thank and recommend our suppliers, hairdressers and make-up artists, share details of our bridal party looks and my mum’s amazing, custom-made Irish designer outfit (I chose the colours I knew suited her best) - but I can’t promise that I’ll find the time. Hopefully, I will, but it’ll remain on the to-do list for another while. Let’s see how I fare with this one! I never even shared an album online, just a staggered handful of photos, if even… not very blogger-esque (I never liked the word blogger anyway and didn’t like to be deemed so). I just don’t know where the past few months have gone. Gone. Honestly. But, I thought maybe it was time to share a few images, before the year is out! As my musings and writings have been primarily style related from the outset, I decided that in this piece I’d tell you about my wedding dress and wedding dress shopping. If you’re a bride-to-be on the quest for your dress, I really hope my list of bridal shop recommendations helps. I think it will. I’ve listed them by county and shared the designers and styles I liked in each. I also tell you about my special memories from each experience. Maybe you’ll discover a designer or dress style that’s right up your alley! Top tip: If you’re unfamiliar with designers of bridal gowns, well, you know that stack of bridal/wedding magazines you were gifted when you first got engaged? Flick through to see what catches your eye. I brought one or two along to the hairdressers and browsed as I got a blow-dry, then I followed all the designers of said dresses on Instagram. Initially, Berta stood out to me. Oh how I pared it back! I’m not sure what your first impressions of my dress are, perhaps they’re ‘Is that it? Is that even a wedding dress?’ Maybe you expected something different from me. I play around with fashion day to day - like many of you, but for my wedding dress I knew I wanted the simplest look of all. Despite having imagined myself wearing a simple sheath/slip dress, I was actually open to every style from the start and willing to try on everything from ball gown to vintage to jumpsuit… just for fun and maybe to surprise myself in the process! I completely understand why brides choose big, show-stopping skirts and ball gowns for their wedding day, as this is your one chance to make a statement on your runway, but I knew that wasn’t going to be me. I wanted to feel comfortable, be able to dance in a lightweight dress, not have excess material to carry around or have bridesmaids fussing over me on the altar. I didn’t want anything tied to a particular era either, like a definite 1920’s or 1950’s look. It’s true that I have loved wearing embellished looks in the past and one of the first dresses I felt great in and was nearly sold on was an embellished sheath by Sottero and Midgley in local bridal shop Simone’s (it’s now discontinued, but here it is). Both mum and I agreed that I’d kinda done that embellished style so many times in the past for various events - that would have been too obvious and plus, that was very early on - I was adamant that I didn’t want to buy my dress too early. I wanted to enjoy the whole process as much as possible and not rush it. I had started the search so early on initially, as a local boutique had invited me in to browse, but I decided it was way too early and abandoned the search for about six months. Mum and I really did enjoy so many days out together. Any excuse. I loved mixing and matching looks and designers, adding embellished boleros and accessories to make it my own. Locally in Sligo, I tried Simone’s and Graceful Occasions. I was hoping to get out to Lamelia, but I just never got round to it. I had hoped to buy my dress locally - I pass by Simone’s every morning on my way to work - and there really was lots of variety, but I didn’t find my dress here in Sligo in the end. In Donegal, I visited Pearls and Lace. This an intimate boutique with a lovely selection and I was interested in this Willow By Watters Irene gown. When I tried it on, I wasn’t blown away by the quality of the fabric unfortunately and the skirt seam was a little ripped, so that was disappointing. They did have other beautiful art deco styles that through a spanner in the works, momentarily. I tried McElhinney’s in Ballybofey, of course! That was a lovely experience. Mum and I made a night of it and stayed at Villa Rose Hotel. I liked styles from Julie Vino with the detailed bodice and plain, fitted skirts and I also adored this relaxed look by Maggie Sottero. It’s now a steal on McElhinney’s online store. I loved the idea of and the versatility of a two-piece, but felt maybe it was a little beachy, or like a look I would actually wear anyway (crop top and flowy skirt) in the summer. You’d definitely wear that top again, but you could mimic that style so much more affordably. It would probably be an ideal, relaxed look if you were getting married on a beach. I have a couple of unworn wedding dresses for sale in Sligo this weekend! I went back to McElhinney’s for their sample sale and I actually picked up a couple of back-ups as I was panicking that I wouldn’t find a dress. I know this may sound strange to some, but they were a steal (honestly), and as you know, I’ve always resold preloved clothing online and at local markets and I could see not only their potential (I had reimagined them slightly), but the resale value. They are beautifully embellished and still have tags intact. I plan to sell them on Saturday, December 15th at The Nest, Custom House Quay in Sligo town. I’m having a pop-up shop for my jewellery, bridal wear and preloved party pieces at the Christmas Bazaar there from 12pm-5pm. It’s hosted by Pulled, who do my screen-printing. The Nest is an all-ages, alcohol-free community arts centre. Over the next couple of days, I’ll be showing you the dresses and party-wear on my InstaStories (@bytriona). If you can’t make Saturday, you can contact me at studio@bytriona.com if you’re interested in a wedding dress for a bargain. Name your price. They will be ideal for some brides-to-be out there. My bridesmaid Avril is based in Limerick, so we organised a few appointments there. We tried Lilac Rose, which had so many heavily embellished gowns from Eliza Jane Howell; I was going all out, open to everything, trying on embellished capes over dresses - the works! The girls were really lovely here. Stacey, if I remember correctly. In The Attic, I got to meet Irish designer Orlaith Carroll and I really enjoyed this session. I must have slipped into 12 gowns, even though we arrived late and had little time before her next appointment. She was a great help. I adored this Elbeth Gillis Nicole gown (here’s a front view) and it was a serious contender from the start… right up to the end. I liked lots of Elbeth Gillis’ designs and Orlaith explained that Elbeth makes your dress to your exact measurements and you can chop and change the skirts. I was really interested in this South African designer. Although you get measured in all bridal shops, the dress usually arrives in and it really isn’t made to measure, which can be disappointing! Elbeth Gillis’ dresses are made to your exact shape. That was something that interested me about her. I liked this Anna Georgina dress at The Attic too. The bodice looks like lace, but it’s beaded. We popped over to Adare (thanks Trevor for chauffeuring us around!) as well; It’s such a pretty little village, where I spent my 30th birthday with Julian. We visited Áibhéil and I tried on some Pronovias gowns. Their crêpe fabric is very figure flattering. My main memory from this store was a lady handing me baby wipes, despite not wearing tan or foundation. I suppose they just like to keep their dresses pristine - not a bad thing I suppose! Also, Av said that while I was getting changed, another bride-to-be came along with a big folder / scrap book of dress cuttings… that sounds like one super-organised bride. I had a more relaxed, rough and ready approach: I take a mental note of everything - I like to say that when my friends tell me I need to buy a diary. I’d recommend a visit to Padanee in Carrick-on-Shannon. The nicest, warmest lady, Patricia owns this bridal boutique and will make you feel so great about yourself. She inspired such confidence in me, making me fit into dresses I thought would never fit. She stocks Irish designer Dawn Fitzgerald and something really drew me to her luxurious silk satin fabrics like in her Goddess Gown, but I wasn’t mad about the cowl back. Patricia organised coffee and cake across the road for Julian’s niece, Sophie and I afterwards. It’s a special memory and just as we left I heard ‘Blackbird’ by Paul McCartney on the radio. It’s now my favourite song and I walked down the aisle to this, leaving the church with the happiest head, singing along to the beautiful lyrics. Sarah Crummy, you were and are Wow! Westmeath/Roscommon - which is it? In Athlone, we visited Kadee. This is one fabulous bridal store… so tasteful and edgy. I was drawn to their minimal designs like those from French designer Margaux Tardits and a dress that wowed me was a sample from Houghton NYC. It was like it was made for me they said. It just hugged my body and hung beautifully. The owners at Kadee are a sister-duo (Katt and Dee) and they said that sometimes the boldest statement is the simplest, the most pared-back. It’s all about you wearing the dress as they say. It was effortless and I loved it, but it didn’t have the low back, which was the feature I wanted most. It was very nearly my dress too, but lowering the back and changing the criss-cross straps would have altered the way the dress hung. Sometimes, it’s better not to see a dress on a model. It’s not going to be the same on your figure. Of course, many times the dress will look better on the model on Instagram, but believe it or not, sometimes the dress may look better on you, on your shape: It’s really all about how a dress makes you feel. And no one else can experience that feeling. I hadn’t seen the gown on a model, until I researched after. It may look like the plainest dress that ever was, but I really loved this on: Bacall gown by Houghton. I remember the girls saying that they’d love to see the dress that would beat this on me. Although I was open to every look at the beginning, soon the patterns in what I was drawn to became very clear: I liked simple. Simple, clean lines. No fuss. I’d heard about Dinagh Modes in Castlerea and had seen some of their custom-made designs. It was a workmate of mine who recommended them. I just wanted reassurance that what I liked and the style I’d narrowed it down to, actually suited my body shape. Yep! They said simple, clean, bias-cut, no fuss. They said to show my skin: shoulders and back. All I needed was that reassurance and I knew it was time to get a move on and buy my dress. Ah, could I have three dresses, please? It’s difficult to choose just one. I mean, I narrowed it down to three dresses. One in Kadee in Athlone, one in The Attic (Limerick) and one in Sharon Hoey (Dublin). It’s not like I could just try on all three at the same time and place and compare them. They were each similar in their simplicity, each had elements I loved, but in the end, I chose none of these! When I finally spotted my gown, I was sold. You may think, well, there’s not much to the dress, but you know what? You can see the thought and time I put in, and how difficult it really is to find the simplest dress! In Dublin, I had tried Dirty Fabulous Vintage and Sharon Hoey. I was particularly interested in designs from Suzanne Neville (this Premiere one was fab) and Sassi Holford (Sienna gown). I visited this store a few times actually. The second I walked into Myrtle Ivory, I spotted my gown. It was the tiniest, unassuming, satin-silk sheath. I tried on ten or twelve dresses, to leave no stone unturned, but none compared to this one in my eyes. It had the low back I wanted, it had the tiniest, barely-there straps I imagined and it was that fabric I seemed to revisit - perhaps a little nod to1920’s glamour. A dress by David Fielden. I slept on it and the next morning I realised that the Sassi Holford gown I had in mind was way too safe an option. I found myself browsing Irish designer Don O’Neill (THEIA) too - I wanted to see all - and realised that the styles of his I liked (Jean and Bruna) were very similar to my David Fielden. David Fielden at Myrtle Ivory it was! That was 1st November 2017 and we got married eight months later. Mother and daughter at Myrtle Ivory, Marina and Meghan, were both great to deal with. Meghan made be realise that if I’d been back to other bridal shops two and three times, I obviously hadn’t found my dress - that I hadn’t been convinced and she was right. She had married the previous year and gave me good advice regarding bridal party wear… ultimately it was Marina who helped my bridesmaids and I make the decision on dresses there and then at Myrtle Ivory…. I think that’s for another blog! I’d heard good things about The White Room in Mullingar and I was hoping to try Folkster (they stock THEIA/Don O’Neill), but you know what? You could spend months and months travelling the length and breadth of the country… you won’t make it to every store that someone recommends! Here our my top 5. You’ll discover loads of brands online too. Instagram is a great source and of course bridesmaids and friends will send you ideas. Just watch this video of Anna Campbell’s Eternal Heart Collection my bridesmaid Brónagh sent me. Wow! I discovered another gorgeous Australian brand called Made With Love. I really liked their Sienna and maybe Georgie even more so, but the only Irish stockist was in Cork (Bella Bleu) and they didn’t stock either of these designs, unfortunately. I was running out of time and unwilling to order online. There are just so many options - all beautiful. Many bridal boutiques discourage you from taking photos - for various reasons; primarily so you don’t get all the details of designers and the codes and then take your business elsewhere. I would dissuade you from taking photos and try to focus on how the dress makes you feel there and then. I’d taken a few photos at the start of my search and ended up really disliking the way I looked in some of the dresses, even though I liked them on in the shop. You’ll second guess yourself too much. Or maybe you won’t - that was just me, probably! Hmmm… I know it’s the one day you’ll probably ever wear a veil, but to me, a veil is a little redundant. Of course I get it, it’s bridal, but not every bride is into the traditional bridal look. I just don’t see it’s significance anymore. Plus, I’d enough going on with my gruaig, I think. Sure didn’t I wear a veil to my communion and at my hen party? I decided to take my dress home to Sligo for alterations as I knew I would be under pressure for time and wouldn’t get to Dublin two or three more times for fittings before the wedding. Imagine that hassle and expense? I would highly recommend Ella and her mum from The Alteration Centre if you’re based in the Sligo area. Ella was a dream and made me feel like I chose the ideal gown for me: You nailed it girl! She accommodated my bridal party and I to suit each of our schedules and fitted us in on very short notice sometimes. My dress had no cups, no boning or corset, no coverups… no help. I knew this fabric was risqué and that I would have to work hard to wear it. Maybe in another blog I’ll tell you about my fitness and diet last year. Ella of course offered padded cups to enhance my décolletage, but it just wouldn’t have been me. I wanted it to be all me. Au naturel. I chose not to wear fake tan either as I’d just been to Seville for our friends’ wedding and actually had a nice natural tan, although I’m not sure it shows in the professional photos. Here is a small selection of photos from our wedding by photographer Darek Novak. Initially, I was super critical of myself thinking I should have looked a certain way: maybe I should have trained harder, lost a few more pounds, laid off the red wine… Yikes, you can see my mosquito bites and where is my nice tan? But looking back at the photos now - five months on - it’s really nice to relive these moments and I appreciate Darek’s beautiful photography style so much. My mum looked amazing! Would you agree? Kitted out in a custom-made Irish design, I think I’ll include this in my next blog. You’ll wonder if you got it right. I had thought about adding to my dress - sleeves or a sheer bolero with pearl detail. Being so simple, I knew I had the option to add. But in the run up to the wedding it was so incredibly hot in Sligo I found myself saying I hope it won’t be too hot! Can you imagine? In Ireland! So, it was the right choice for me on our day. You can see that we were blessed with the weather. And… it wasn’t too hot! Just right. 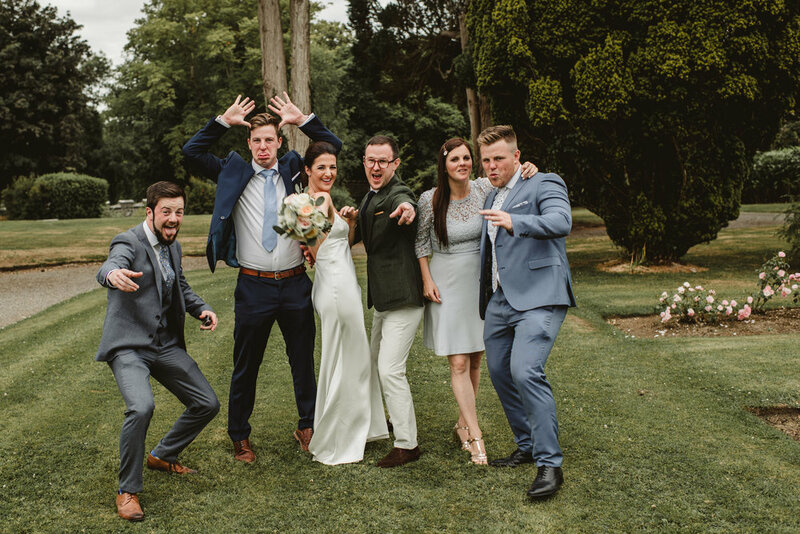 I think anyone who got married in Ireland this summer (2018) lucked out. What a day! Some of my fondest moments of the day were taking time-out with Julian after a beautiful ceremony to walk the beach at Culleenamore. We got the fun bridal party photos at Strandhill beachfront and the cannon shots I’d hoped for for months and some special photos on our beloved Wolfetone Street that I wanted. I’m really glad we took the time to capture all these. Would you sell your dress? Wedding dresses still clog my Instagram feed and I admire them all, but it’s the simplest looks that I still love the most and that reassures me that I stayed true to my own style. Also, as strange as it may sound - it being a wedding dress and all - it would kill me not to be able to re-wear my dress. I’d hate the thought of it hanging there forever. I plan to shorten my gown and wear it again - 100% - if I still fit into it! It’s a versatile piece that I can add to for sure. I like my fashion to be functional. What I did invest in were designer shoes. My first pair! I’d read about Sophia Webster and initially wanted her signature Evangeline shoes, but then thought to myself Are they a little Gypsy Bridal? I opted for her Rosalind Crystal rose gold staple heels in the end as they were sophisticated and very wearable - I’ve since worn them on honeymoon and to other weddings. Definitely a good buy. Top tip: Get your nearest and dearest to buy you Brown Thomas vouchers this Christmas/for your next birthday - it really helps if you want to treat yourself to shoes or something special for your wedding day - something you may not normally ever treat yourself to! What are your thoughts on an evening dress? Cool, if you feel the need and I suppose it’s fun to change into something fresh and a totally different look, but personally, I loved my dress so much that I didn’t want to take it off for the day! Well, that was a soliloquy! Sometimes, it seemed people were more excited about my wedding than maybe I appeared to be. There were so many things I enjoyed in the run up to the wedding, but I could get very anxious about things at times too… it’s the unknown; I’d never done anything like this before, I didn’t know how it would pan out or if everything would come together. I think every bride has worries. It could be appearance, weight, skin, money, hair, family - everyone has these worries: be it estranged parents or siblings or aunties or uncles. Every single person has something, they just may not talk about it! That’s one rare sight: the six siblings together in a photo. I was so so happy to have my whole family by my side on our wedding day. It’s a rarity to get all eight of us together in the one country. And that’s one rare sight: the six siblings together in a photo: Laughing and joking and taking the absolute piss out of each other as usual. We keep each other grounded - that’s for sure! I spent the night on the dance-floor surrounded by them - each of us so different, I would be lost without them. Weddings provoke and unearth different feelings and issues, but my God, as for mum and dad - for a pair that are never in a rush to give any of us away (I think they worry enough for us and want us to bide our time), I have never seen my mum so giddy and excited and my Dad spend so long in the garden… our family home was immaculate, garden - perfection. You may not believe it, but I got a slight touch of body dysmorphia in the days following my wedding. Well, self diagnosed… maybe I just got very self conscious. I don’t know was it because I saw a dodgy photo or what, but I was finding fault with practically every part of my body. Perhaps, it was exhaustion. I can’t say I ever got the post-wedding blues, but maybe I was emotionally exhausted. I became fixated on various body parts, some that I never worried about ever before. Anyway, it was momentary really. I do think there is a lot of pressure on brides to strive for perfection and to follow the latest trends. I feel like the girls (my #ridesmaids) deserve a whole separate blog, so I won’t go into too much detail here. I am blessed to have had so many options that made this choice possibly the most difficult and stressful of all. Definitely time to call it a day here… this has taken me hours. I look at this selection of photos now - five months on and with a different outlook, and I’m so pleased with them (thanks Darek Novak). It was a magical day and I can’t help but be excited for all the brides-to-be out there - a special road ahead. I now know why everyone was so excited for us - such overwhelming love, warmth and well wishes - it has taken me months to digest it all. Everything does come together and although it’s lovely to get advice from people, they’ve only done it once too - no one knows it all; no one is an expert! Do it your own way and in your own time. If I’m honest, I left much of my wedmin until the two weeks before our day, but I was off work and knew I had time… I’m last minute and that’s always the way I’ve worked. I enjoyed those couple of weeks so much as I felt in control of things, like I was making progress. I even had time to sun myself on Rosses Point beach an hour here and there, while ticking off my daily checklist. I think once was enough. I think it’s a great thing to do and it’s an achievement to have organised such a big event. I did love dress shopping and days out with mum and all the love and support from everybody. I liked getting fit again and my God, I loved my hen party. But Jules and I don’t like fuss - we like simple things like our meals out together and walking our dog Bow, so I’m kinda happy it’s all back to normal! I’m not an overly lovey-dovey, affectionate person, but I find myself feeling thankful for all life’s little pleasures and the important people, especially Julian, in my life - although I may not express this outwardly often. Maybe it’s the time of year! If you are unsure about getting a video, I say do it! We are so pleased we got one in the end. It captures the day, feelings, voices, ambiance so beautifully and succinctly. Have a look at ours! I would highly recommend Stephen Kilfeather (and Fionn Rogers). Ok, I think it’s really time to call it a night here. I hope to write another blog to thank all our other suppliers, who are definitely worth mentioning. I just cannot write anymore right now. 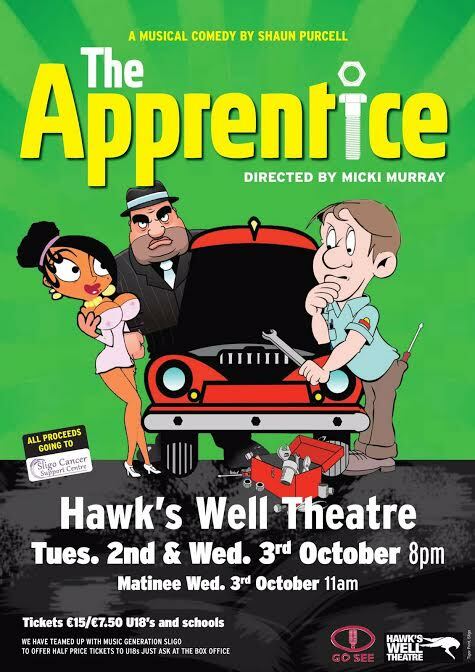 The Apprentice | Hawk's Well Theatre. On Sunday night I went to the Hawk’s Well Theatre to see David Kitt. I was delighted to get a ticket last minute as I was sure it’d be a sell-out. I used to listen to David Kitt in my teens and early twenties and his music always transports me back to special moments growing up; listening to mixed tapes (precious old homemade gifts), which I can no longer listen to in the car; and fond memories of home life. I was really shocked and a bit sad to count less than 30 people in the auditorium just before 8pm. I couldn’t believe it. I know I don’t go to the theatre often enough, but when I do, I always really enjoy it, I feel energised and hopeful and promise myself to make more of an effort to attend regularly. Shortly after 8pm there was probably a crowd of 50-60... lucky for us, sure, as it was such an intimate gig, but a pity all the same that there wasn’t a better turnout. The theatre should have been full! That’s when I knew I had to help spread the word about an upcoming show called The Apprentice - to do my bit - before it’s too late. Here is the cast of this musical comedy by Shaun Purcell - small in size, but big on personality and projection! 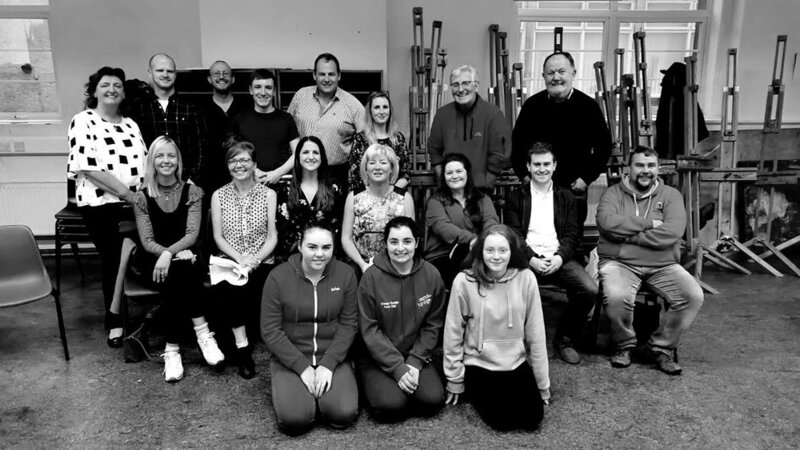 Directed by Micki Murray, the comic also stars in the show alongside leads Declan Walsh, Elaine Gordon, Luke Devaney, Patrick Ellwood, Vanessa Saunders, Brendan Tierney, Michael Fox, Maggie Curley and Stephen Rushe. I go to see Shaun Purcell’s show every autumn. All the music in these shows is original. Shaun writes all his own plays and songs and composes his own music; he really is an extraordinary local talent. Over the past couple of years his works have explored darker issues and tragedies, but this year’s production is much more upbeat in the form of a comedy. Expect lots of laughs and a love story. I normally go to see my friend Vanessa take part, but this year they were looking for some chorus members and I was kinda at a loose end - with no wedding to organise, I needed a new project to channel my energy! Plus, being part of Strictly Come Dancing, a hugely successful fundraiser for Sligo Rugby Club (we helped raise close to €70,000), was one of the most enjoyable experiences in my life (and I don’t use the superlative lightly); I loved the camaraderie, the whole process and the dancing itself, of course. You wouldn’t believe the come-down I experienced after such elation, I knew I had to get involved in something again. Joining me are a few fellow Strictly dancers and friendly faces who have proven to be great singing talents! It’s the truth, or at least that’s what I’ve come to believe, but in my defence, I haven’t sung in 15 years - not since our choir (obligatory) at school. We each have different talents and fortés, right? Variety’s the key - that’s the spice of life! That’s one of the lines from our opening song. I’m encouraging you to come see the show as, I can assure you, there are so many talented actors and singers involved and not only will you have a great, uplifting evening and share a few giggles, you’ll be supporting a wonderful local facility. All proceeds Sligo Cancer Support Centre. You’ll see me dancing in the background - I shied away from any singing. You wouldn’t believe how awkward I can get in certain situations out of my comfort zone. I hadn’t really mentioned the show to anyone until now, but I’ve realised that it’s up to each cast member to get bums on seats and we don’t want to perform to an empty auditorium. Choreography is by Ingrid McLoughlin - my favourite part of rehearsals! I urge you to please get booking your seats. The show only runs for 2 nights and it’s suitable for all age groups. There is also a matinee at 11am on Wednesday 3rd. Dates: Tuesday 2nd & Wednesday 3rd October. Venue: Hawk’s Well Theatre, Sligo. Our community is generally very good at supporting local so we’d like to thank those who have already booked tickets and shown their support. If you’re travelling to Sligo for our show, The Glasshouse is kindly offering the following special rates: Standard Single: €70, Standard Double: €80, Deluxe River Facing Single Room: €90, Deluxe Double/Twin: €100. Each includes breakfast. Call +353 71 91 94 300 or email info@theglasshouse.ie to make your booking. Just mention the show (The Apprentice) to avail of these special offers. Spring is here at last and I thought it was high time I said hello! I'd been hibernating the past month and really enjoyed my time-out offline. I think we can all get a little disillusioned with social media and it can be difficult to keep all sides going. I was very busy before Christmas and really welcomed the break. I'm finalising some new designs and hope to share all with you very soon. I took advantage of the break last month to plan for our wedding; There always seems to be some decision to make, something that keeps me awake at night or more to the point some deposit or another to pay! We're getting there I think. The countdown is on and I really hope it all comes together. Some recent copies of Galway Now Magazine where you can read my monthly 'Trend Bytes' column. I'll share more details at a later stage, but for now, I wanted to share some products I'm enjoying and some upcoming events I'm involved in. I still write a monthly column for Galway Now Magazine where I talk about everything from fashion, design and beauty to my bid to become fitter and healthier. I got my very first Fit Bit Alta HR for Christmas and it’s the gift that keeps on giving. It’s a great motivator for getting active as it tracks my steps, workouts, calorie burn, heart rate and sleep. Fit Bit is a lot more accurate than your smart phone for monitoring your daily activity as it’s strapped to your wrist. I’m much more conscious now of reaching my daily goals like walking 10,000 steps, increasing my heart rate during workouts and trying to get to bed a little earlier (I’m a real night owl). It’s like a game you play against yourself. I would highly recommend a Fit Bit. My colleague and friend Saoirse Faughnan is organising a Charity Valentine’s Ball in aid of Pieta House on Saturday 10th February at 7pm. The event takes place at McGettigan’s Hotel in Letterkenny with a champagne reception, four-course meal, guest speakers and music on the night. It's a really worthy cause and it promises to be a fantastic night. The last few tickets are available here. I will be exhibiting my designs and donating 20% of all sales of my Silver Linings Collection to Pieta House. 'Trend Bytes', February 2018. Galway Now Magazine. Two products that I’m really enjoying lately are Soleil Tan de Chanel for its sun-kissed, velvety finish and Benefit’s Boi-ing concealer for its flawless, ‘airbrush’ effect. Gone are the days that brides splurge on bridesmaid dresses. I fell in love with the Jenny Packham No.1 range at Debenhams - one dress in particular, but in the end opted for something a little more youthful and flirty. Plus, I bagged them during the Black Friday sales! When planning a wedding, there's always something to pay out for, so it helps when you spend less than you'd anticipated on certain things. Did you hear that leading UK stylist and TV personality Gok Wan is bringing his Fashion and Beauty Collective to Ireland? It’s all happening on Sunday 4th March at Clayton Hotel in Sligo where there will be catwalk shows and makeup demos, afternoon tea, prosecco and goodie bags, and one audience member will be picked for a Gok Wan Makeover on the day. Tickets are available on his site here. His team contacted me to be the exclusive jeweller to showcase and sell at the event. I'm looking forward to revealing my new designs for Spring/Summer 2018. If you want to be the first to know about my new work and upcoming events, you can sign up to my newsletter via www.bytriona.com. So, there's a quick update on what I've been up to. I apologise if you've been missing my blogs. I hate to think I'm bombarding people with content and so, I sometimes just don't post at all. I know I should really be more active online to share images of my products; I'll try. I wanted to share one of my favourite and most popular blog posts ever. I wrote it at the very start of this year and the response was overwhelming. It seemed many of you could completely relate to what was on my mind and what I had to say. It's something that's not often spoken about, but it was a topic that had been on my mind for years - about those silent pressures women face to get engaged and married and how women's achievements are often dismissed or shunned. It was a piece that I really enjoyed writing - possibly my favourite - and about the only one that I like to reread from time to time. It was on this very date last year (December 18th) that Julian proposed. I tell you all about it and the way I'd been feeling prior to getting engaged. I'd been thinking that there was something amiss - with me; Getting engaged and married was never my main aspiration in life and I felt that I was in the minority. I'm not normally the lovey-dovey type when it comes to my personal relationship, but I open up a little here. As you may have seen on Facebook and Instagram last month, Julian asked me to marry him and I said ‘I will.’ It was the week before Christmas on a sunny Sunday by the sea. Firstly, thank you all so much for your kindness and warm wishes. I tried to get back to everyone individually. I couldn’t believe the response. I suppose it is a big deal and it truly is an exciting time, but there are other milestones and accomplishments that women work hard to attain that I would regard higher than getting engaged or married. I read and shared an article recently that really rang true for me. The crux of the article was that in 2016 being popped the question is or was still more celebrated than academic and professional pursuits of women. Natalie Brooke wrote: ‘You don’t have to have a brain, drive or special skill set to get married.‘ I’ll share the link below. Getting married isn’t the end goal for me. This has been on my mind for years, but only now is it appropriate for me to write my thoughts on the matter, without sounding bitter – now that I’ve joined the club. It’s for individuals who value other achievements above getting engaged or who have been made feel like they’re the last one on the shelf. We are not ‘leftover women’. We were taught to achieve, not to be subservient. Marriage was never a priority of mine; It was never that clichéd something I dreamed about as a little girl; never something I aspired to. I often wondered if there was something wrong with me. Why does everyone around me melt at the sound of ‘wedding’. I’d question if marriage was for me. I’d attend weddings and it would upset me sometimes as I’d be genuinely so happy for the couples in question, but couldn’t picture myself celebrating such a commitment. I’d wonder how are they ready? Do they know what they’re in for? How can you be so sure? People who are so sure of everything and make longterm plans scare and unsettle me a little. I take each day as it comes and don’t like to make rigid plans. Maybe I wish I was more like them – more trusting. Everyone has different priorities. Marriage and kids just weren’t top of my list. I wasn’t ready for a long time. I always take the scenic route – in everything I do: study, career, relationships. I don’t rush in or settle for one thing. I’m always a little unsure or curious and have to explore options. When it comes to matters of the heart – I’m very cautious. But what was I waiting for? Something better to come along? Someone to sweep me off my feet? Maybe I’d forgotten: Julian did sweep me off my feet. It was just a long time ago. Very early into our relationship I remember thinking: This is what a relationship should be like. He gives me plenty of space, yet he’s keen; he is in no way possessive or jealous; he encourages me to do what I want and doesn’t stand in the way; he’s incredibly content in himself and he trusts me. We’ve been together several years. I can’t tell you how many specifically as we don’t actually have an anniversary as such. We were never counting. I’d just returned from travelling South America when we first met at a toga party, he took my number and 2 months later he asked me on a date! I agreed thinking ‘I’ll have nothing in common with this guy from Sligo, but sure I’m moving to Bath in 2 days so I’ve nothing to lose.’ I was due to start my MA in Interpreting and Translating at The University of Bath, UK. I kept it casual and wore jeans and a T-shirt. Our first date was in a cubby in Hargadon’s pub and to my surprise, we really hit it off. How typical? I moved to the UK 2 days later and assumed that was the end of it. Later that week, I got a call. It was Julian. I was really surprised to hear from him and it lifted my spirits and my heart. Our weekly phone calls became nightly chats and it was nice to have a link to home. I’m not big on phone calls, but I hated hanging up on him. See, a masters can be a very solitary experience and moving country alone can be lonely. 2008/2009 – I just had to check my CV there. That’s how long we’re together – at some point in that academic year we became an item. We have well and truly wintered and summered together. The truth is I was crazy about Julian when we first got together. Our honeymoon period lasted years. Then, being together so long, things can become very normal and you wonder where the excitement has gone. We never do anything. We never go anywhere. I think we can all feel this way sometimes, but it’s up to both of you to keep that spark going. Although we have lived together for almost 6 years, what has brought us closer together over the past year was buying a house together and building a home – seeing it all come together amidst the financial strains. I’m excited for the next project. No relationship is without its flaws or hiccups so I’m not going to pretend that there haven’t been moments of temptation in the past. I’m human. In your mid-late 20s you may start to question longterm relationships: I’m too young, I’m not ready, but now I think that there would be something wrong if I didn’t question. It’s OK to question. Sometimes you may feel that everyone is moving forward and you’re at a standstill – and that may be your own doing. When it comes to choosing a dish on menu I can be indecisive – I just want everything on the menu! But, this was an easy decision really. I’ve made my decision now. Julian never lets me down. He doesn’t let anybody down. He’s the type of person you can really rely on. Just a really decent skin. Day-to-day we are very very content and that is what counts, I think. We both had surgery last year and a stint in hospital – another experience that really brings people closer together. He does little things for me like filling my windshield wiper when I’ve put it on the long finger, he hoovers and brings my car to be washed if we’re going on a journey, before Christmas he cleared out one of our attic rooms so I’d have a studio space to make jewellery, he bought a table with raised edges – so the beads wouldn’t roll off – he thinks of things that would never cross my mind. He converted the spare room into a walk-in wardrobe so I’d keep my mess confined (I can’t say it worked). I asked for none of this. This is just Julian. We’ve all experienced heartache, but trust that there is something better for you around the corner and it will happen when you least expect it. In relationships, we all need people who will add to our lives. You may be a very positive force is someone else’s life, but ask yourself: are they good for me? A poem I loved learning and analysing in school was Twice Shy by Seamus Heaney. It’s one I often revisited and funnily enough read it Friday night before we got engaged. Above are some of my favourite lyrics, but you can read the full poem here. In my 20s I would shudder at the thought of getting engaged, mainly because it was what others thought we should do. Living your life the way others want you to live is a terrible way to live. All those expectations others layer upon you. You can end up feeling deflated when everyone preps you He’s definitely going to ask you this time – deflated for something you didn’t even wish for – it’s just the expectations of others. Thankfully, Julian knew that I wasn’t ready in my 20s. Was it a surprise? Yes. Obviously, being together so long I presumed it would happen eventually, I just didn’t know when. Had he asked me on my 30th birthday, I would have said yes. If he’d asked me last summer, I would have said yes. I’m ready now. I imagined we’d be on holidays somewhere and I’d be wearing a beautiful outfit or we’d be visiting Bath to do the Bath Half Marathon again, but as it turned out: I was windswept, wearing flats and had my Christmas party the night before – so let’s just say I’ve probably looked better. It didn’t take from the special moment, however. It was all very normal – which I suppose added to the surprise – a Sunday in Strandhill. We got hot chocolates as normal and went for a stroll to the right of the cannon in the direction of Killaspugbrone. It was a particularly beautiful day. There was no one around, except a lone surfer in the distance. It’s a bit of a daze. I remember what we were talking about, Knocknarea was Julian’s backdrop, I glanced at the promise ring, I heard him out, but I had to be reminded if he actually got down on one knee! He did. Did he ask my Dad? Yes. Ok, this isn’t an Instagram-worthy snap, but here it is in all its filter-free rawness. Windswept beach strolls to clear the cobwebs. I love that he proposed at a special place, close to home with family and friends close-by so we could share the news in person straight away and witness their reactions. I also love being able to walk to the spot whenever we want. The timing was all right. I truly think it’s all about timing. I’m very happy at work at the moment and love our home and lifestyle together. These past 3 weeks have been a little cocoon of content. I just want to stay here for another while before I hear another have you set a date yet? Does anything change? I really think something does. You look at the person differently. You become even closer in every way. Trying to choose a ring at Wehrly's. Christmas party the night before.... that was a whole lot to take in on a Sunday! I know the real accomplishment of marriage begins long after you say ‘I do’ when you’re able to weather what life throws at you and blesses you with. My parents celebrated 38 years of marriage at the weekend – rearing 6 kids – think of all the storms, successes, laughter, sickness, loss, heartbreak, tears, financial strains, disappointment and joy that they have weathered together. More solid now than ever. As for Julian’s parents, his Dad still brings his mum breakfast in bed every morning. Now, if we can achieve half of what our parents have together, I think we’ll be OK. Although I still have my own dreams and goals, I am excited to embark on this new journey with Julian by my side. We are a team now and it’s reassuring to know that this 1 person actually really loves you and always has your best interests at heart. Here’s to achieving your own personal goals, waiting until you’re ready and not giving in to those silent pressures. The article I referred to earlier can be read here. So, it's one year on now and to be honest, it's only in the past 2 months or so that we've had the chance to think about our own wedding and get excited. We were invited to 10 weddings between March and September of this year so our energies and thoughts were elsewhere, I think. For the first time ever, we've had an actual date to celebrate, so we spent a couple of days in Galway with friends. Jules booked a hotel out of the blue a few weeks ago, but really it was to go to the Connacht game as opposed to whisking me off for a romantic getaway! The dates just happened to coincide. The lads went to the Sportsground, while we did some Christmas shopping. It was such a laugh with our best buds and we're hoping to make it an annual escape before Christmas. We discovered a real gem of a restaurant called Il Vicolo - you should check it out if you're looking for a nice place in Galway. We'll definitely be back. We finished the weekend off with some mulled wine at the markets. As regards wedding planning, we're slowing ticking things off our list - at our own pace anyway. We've had a pretty laid-back approach, but we've had time on our side. I haven't over-shared or revealed too much in terms of our plans, but maybe I'll save that 'til another day when I've a bit more time off over the Christmas break to write. I'll tell you what I struggled with and what I've really enjoyed along the way - so hopefully that will help some of you who are planning / those of you who are about to get engaged and may not be expecting it! In terms of my own goals, I'm pursuing them daily - with my online shop and jewellery design. Thank you so so much to all of you who have purchased my designs, have expressed an interest or have taken the time to wish me well. I'm so happy! December is already flying by! We've had Christmas parties galore and there are many more yet to come. I've been tipping away trying to keep on top of orders and deliveries before I give my collection one final push across social... before it's too late. There was a great response to my Black Friday - Cyber Monday sale. I seemed to have underestimated the interest and had to restock for the Christmas rush. If there was a little delay in delivery at all, you know it's because I'm finding my feet, so thank you for your patience and for understanding. Keep an eye out for future flash sales! In this post I just wanted to introduce the latest addition to my Silver Linings Collection: Raindrop Earrings in solid sterling silver. I am so excited about this product. I really love them so much! They're a follow-on from my original raindrop necklace design - drawn by hand and handcrafted in solid sterling silver at Leitrim Sculpture Centre. They're high polished this time and I promise you that they're twice as nice! The raindrops are for the minimalists among you and for those who dance in the rain. They're a little tongue-in-cheek and subtle nod to the Irish weather, which is a conversation starter - whatever the weather. Other interpretations of my drop designs are teardrops, flames and commas, so we remember to pause and reflect. I hope you love them as much as I do.... I'm so excited about them! Wear with our Raindrop necklace - one of our best selling pendants. My drop earrings will be available in rose gold plate in the New Year. Best wishes for the busy weeks ahead! I just wanted to say a huge thank you for your orders over the weekend. I got so excited with each notification and loved sending off all the packages this morning. For orders made within Ireland, your package should arrive by Wednesday, if not tomorrow. I'm restocking my rose gold pieces later this week as well as my silver raindrops and best-selling Silver Lining. I still wanted you to avail of the discount so included these pieces in the Black Friday - Cyber Monday sale, despite having sold out, so I thank you for your patience with these orders. They will be with you early next week at the very latest. I'm sure you understand that I'm only a month up and running, I'm still finding my feet and perhaps underestimated the response to my designs. If you've been distracted by the Royal Engagement today, but wanted to avail of my Cyber Monday Sale, there is still time! 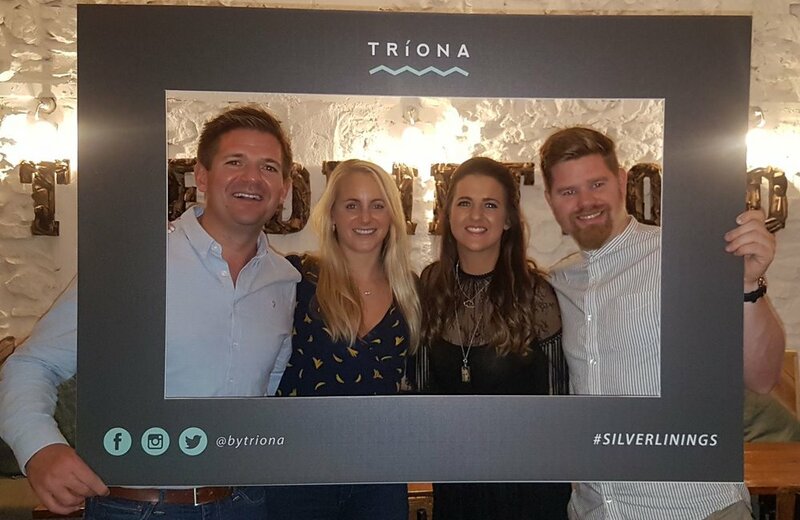 Grab 10% off at the checkout using discount code: #TRIONA10 until midnight. Also, a big thanks to all who signed up to my newsletter. I promise not to bombard you with emails. It will only be to tell you about upcoming events, secret sales and special news! If you'd like to be the first to hear the latest from TRÍONA designs, feel free to subscribe to my newsletter. I hope you've had a lovely weekend. I just love weekends! For me, it's all about good food, rest and spending time with friends and family. I try to fit in a long run too... I'm slowly trying to get back on track. I just wanted to pop on and say thank you for your support and interest in TRÍONA designs and give you some updates. My raindrops and silver linings are almost sold out since launching two weeks ago. These are the most popular pieces as not only are they affordable, they are really beautiful, wearable designs. I'll be restocking both, along with rose gold raindrops and clouds - end of November. I'll let you know as soon as they're ready via Facebook and Instagram, but feel free to drop me an email on studio@bytriona.com if you'd like to pre-order. In fact, I may do a little pre-sale later this month! I also wanted to tell you about our sustainable packaging. 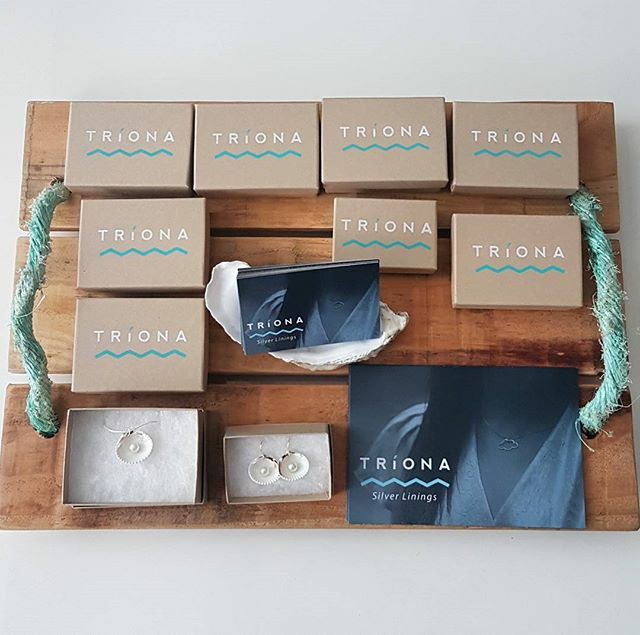 Each piece of TRÍONA jewellery comes in a little box. The important thing about these boxes is they're 100% recycled. Each box is made from recycled kraft paper. The synthetic cotton filler is also 100% recycled. It's important for us to do our bit, however small, for the environment. 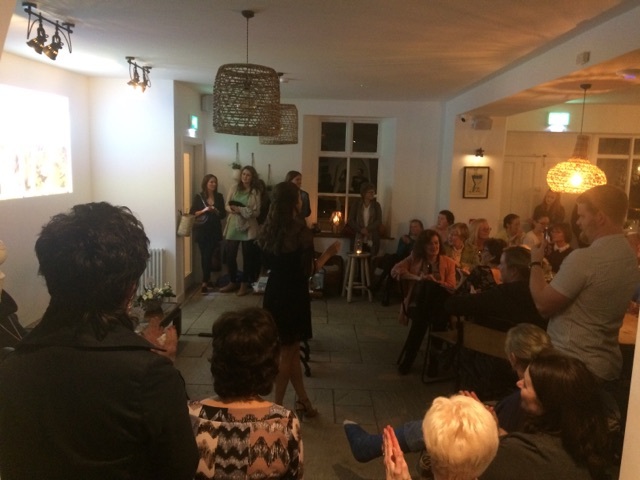 On Wednesday evening I launched my design brand TRÍONA and online shop at The Driftwood restaurant in Rosses Point, Co. Sligo. It was the perfect venue and setting for my launch party. This beautiful space has such a welcoming and relaxed vibe, frizzante on tap and decor that is sans pareil. I still can't believe the turnout - almost 100 people at one point. I got a little overwhelmed and teary-eyed when I saw my mum walk in. She was beaming. She may have contacted just about everyone she knows living locally from her literary ladies at book (wine) club to her work colleagues... as well as every contact in Dad's phone. Well, I think she got as far as D anyway. Dad reckons I should have another launch next week for E, F and G. Ah, you can't beat a Daddy joke! If you didn't hear me say it before, I want to thank everyone who came out to support me, and of course to those of you who couldn't make it, thanks for your well wishes, flowers and cards. I haven't had a chance to respond to everyone's messages, calls and mails, but I will! The Driftwood very kindly served frizzante and canapés to all our guests. I was in good hands and it was so reassuring to see all the happy faces. For the very first time ever, I wasn't too nervous speaking in public - I was amongst friends and well wishers and it was my time. 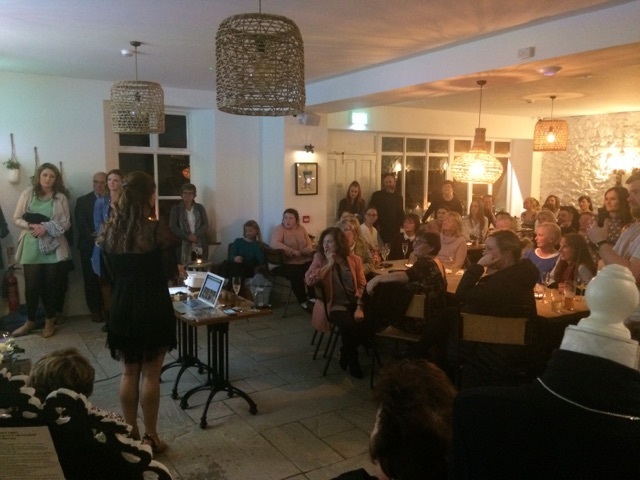 To explain how my Silver Linings Collection came about, I gave a presentation about my blogging journey and revealed my brand new website and shop www.bytriona.com. I talked through each product briefly and had a selection of my designs on display. I also thanked everyone that helped me realise this dream over the past year. To celebrate the launch, use the discount code #SILVERLININGS to get 10% off until November 1st. Thanks again for your encouragement and positive response. Thanks to everyone who purchased on the night, placed orders and expressed an interest in my designs. Here's to many more creative endeavours and future collaborations. Email: studio@bytriona.com or follow my journey on social @bytriona. I’m having a launch party and you’re invited! It kicks off from 7:30pm this evening at the beautiful surrounds of The Driftwood in Rosses Point, Co. Sligo.